In an exclusive interview with the Managing Director of SMERGERS, Vishal Devanath and Executive Director, Reema Mukherjee, SME Times finds that Small and Medium Enterprises (SMEs) can get funding through Private Equity, Venture Capital firms or Strategic Acquirers. They said, strategic acquirer not only brings in money but also expertise and network which the SME can benefit from. SMERGERS is a Small and Medium Enterprise (SME) focused Mergers & Acquisitions (M&A) Firm. They assist buyers and sellers of small to mid-market companies. SMERGERS specialize in M&A, Venture Capital (VC) and Private Equity (PE) fund raising services to SMEs, family owned businesses and startups. Vishal Devanath is the Founder of SMERGERS. He is a proud product of the reputed IIM BangaloreHe has significant experience in managing complete deal lifecycle including the $200 million acquisition of DigitalRisk by MphasiS. Prior to Avendus, he has worked with leading firms such as PricewaterhouseCoopers and National Instruments R&D. Reema Mukherjee is Executive Director of SMERGERS. She is also is a product of IIM Bangalore, where she was the second woman to lead the Students' Council as President since inception of the Institute. She also holds a B. Tech degree in Computer Science & Engineering from West Bengal University of Technology, where she secured first rank in her department for 8 consecutive semesters and is an Institute Rank Holder. Vishal saw that SMEs were under-served by existing investment banks. But there are around 48 million SMEs in India and rapidly growing. This was a huge market to be ignored and that's when SMERGERS was born. Please tell us more about SMERGERS. What kind of services do you have? 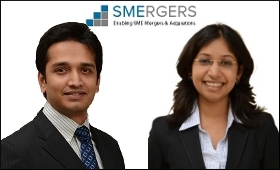 Vishal Devanath: SMERGERS is an SME focused Mergers & Acquisitions company. We help Small and Medium Businesses achieve their strategic and financial objectives by assisting them in mergers, acquisitions, divestitures and investments. We provide both buy-side and sell-side services, which include Business Valuation, Information Memorandum Preparation, evaluating Potential Targets, Transaction structuring, Target/Buyer mapping, etc. Reema Mukherjee: Our proprietary technology platform enables us to connect with a large number of SMEs and Investors in India and abroad. This gives us the ability to source relevant acquisition targets and business buyers to bring the transaction to successful closure and achieve our clients' goals. What are the different models SMERGERS uses to work with Small and Medium Enterprises (SMEs)? And how would your services help them? Reema Mukherjee: At SMERGERS, we have carefully customized our services based on the needs of our clients. Typically smaller businesses, such as independent restaurants or boutique shops, need only introductions to potential buyers without the need for professional services like business valuation or information memorandum preparation. Likewise, clients looking to invest in smaller ventures typically give more importance to location, facility, number of employees etc. without dwelling too much on the financial statements and future cash projections. Vishal Devanath: On the other hand, bigger and established companies, such as manufacturing units or IT/BPO companies, find it critical to have formal cash flow projections, information memorandums which position the company and set valuation expectations right. Most investors and acquirers look for these documents to understand the target company better. Can you describe a typical client of yours? Vishal Devanath: As mentioned our world focuses around SMEs. 1. First generation entrepreneurs looking to retire and reap benefits from a lifetime's worth of hard work in building a business. 2. Promoters running multi-line businesses aiming to focus on core business by divesting of non-core areas of business. 3. Business owners with their children settled elsewhere, without successors to manage the business. 4. Business owners choosing to relocate to a different country/city or to their native place, without day-to-day hassles of running a business. 5. Entrepreneurs facing stagnation due to capital shortage and hence seeking funds/partnerships to take business to the next level. 6. Promoters facing other personal issues like health challenges, etc. 1. Private Equity and Venture Capital firms with a focus on SMEs in specific sectors. 2. Larger Corporates in India looking to acquire multiple SMEs for diversification, growth etc. 3. Foreign Corporates and SMEs looking to acquire Indian companies as an entry to this geography, for cost efficiency, defense offset, technology advantages etc. 4. International Funds looking to invest smaller amounts in multiple businesses instead of risking it by investing into a single company. 5. NRIs planning to return to India and aiming to get involved in Indian businesses as owner or director. 6. Individual investors looking to start a business by buying out existing entities, which reduces risk, provides immediate cash flows, guarantees established relationships and helps avoid time consuming tedious startup work. 7. Banks and financial institutions looking to provide capital/debt to SMEs in India. Access to finance is one of the prime areas of concern for Indian SMEs. It is extremely difficult for SMEs to get loans from banks. What are the alternative options of funding for SMEs? Reema Mukherjee: The first apparent avenue for access to funds for SMEs are Private Equity and Venture Capital firms which provide necessary finance to companies for equity in return. Another viable option for SMEs would be to get funded from a strategic acquirer, who not only brings in money but also expertise and network which the SME can benefit from. Do you also have financial consulting services for SMEs? SMERGERS has access to the right network of genuine buyers and sellers. How do you check for genuineness of your clients? Vishal Devanath: Every registrant on our platform is verified by our team through basic due diligence and background checks of information provided by our clients. For businesses, we provide an option to upgrade their status to 'Verified' for increased credibility. We achieve the same by authenticating their details with the Ministry of Corporate Affairs and/or audited annual statements. How difficult is buying / selling of a business in India? Reema Mukherjee: Buying and selling of businesses, though historically prevalent, have always been challenging in the SME space. This is mainly because of the lack of professional enablers who understand the nuances of business transactions. Due diligence, valuation, legal documentation, confidentiality etc. are key concern areas and that is where SMERGERS delivers value. Vishal Devanath: Business Acquirers and Private Equity investors find it hard to find suitable companies which fit their investment criteria. Even if they find one, it is difficult to communicate with the company directly as it might seem inappropriate. Similar problem exists on the Sell Side as well. Business owners or fund seekers find it challenging to source genuine acquirers or investors for their businesses. Even if they find one, they cannot approach them directly because of confidentiality reasons until genuine interest of the counterparty is established. Selling a business is a very important event in an entrepreneur's life and is mostly once in a lifetime experience for business owners. They need assistance from professionals who have experienced similar transactions and understand the finer details of selling a business. You have an online Company Valuation Tool and detailed Valuation services for your clients. How is it helpful for SMEs? Reema Mukherjee: Every business owner who is looking to divest or raise funds wants to know what his company is worth. Not only does this help him understand valuation drivers for his company, but also gives him a realistic estimate of what he can expect for his company in the market. There are many well accepted ways by which a business is valued and one such method is the Trading Com-parables method. Stock market data of similar companies from the same sector is used to derive a valuation range for the company being evaluated. The business owner can simply enter a few financial parameters on our online tool and view a guidance valuation range for his company. This valuation is derived from a complex back-end with data from thousands of publicly traded companies in India and other emerging markets. Vishal Devanath: Of course, there could be many other factors apart from the financials affecting a company's valuation, which include tangible assets, higher than industry growth rates, patented technologies, goodwill, networks etc. Our detailed valuation service considers all factors and uses multiple methods, such as Future Cash Flow, Market Comparables, Prior Transactions and industry specific valuation techniques to arrive at an objective sense of the business's value. What are the charges for your services? And how cost effective are your services? Reema Mukherjee: We understand that our clients are cost-conscious. All mandates (both buy and sell side) have a post transaction success fee of 1% at present. Upfront charges depend on services which the clients choose from and range typically between ten to fifty thousand rupees. Our services are customized based on specific client needs and relevance. Compare this with other advisory firms which charge clients retainer/upfront fees, generally in the tune of lakhs of rupees and post transaction fees of 3-10% of the deal size. Vishal Devanath: There are more than 48 million SMEs in India. We have a long way to go in making a significant positive difference to the SME segment in our country Our Vision is to make Mergers & Acquisitions, a well-established strategic instrument traditionally leveraged by larger companies, directly accessible to Small and Medium Enterprises (SMEs) as well. We are looking for an investor for our 1000 pairs per day (Rs.500000.00 TO/Day) .We tried reaching you but could not.Can you please assist us in scaling up our operations.We have orders, good plant but lack working capital. I too agree with your views . However , a big issues in the successful entrepreneur's is their EGO and un ableness to adapt to new situations and Technologies'. I would be happy . If we are able to discuss few things. This is an absolute winner as it is for the first time that SME's can take advantage of the M&A route. Kudos to U guys for taking up this challenging yet satisfying work.As an SSI enterprenuer I know how essential this is for growth. I would say "Aquisition made easy" for SME's with easy and simple approach. This is a need of the hour and would benefit lot of Indian SME's.